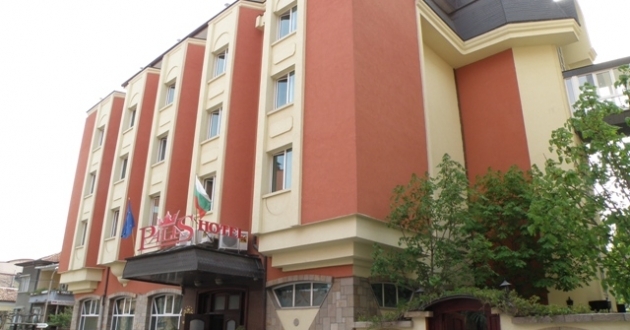 Location: The "Palace" Hotel complex is situated in the centre of the town of Kazanlak. The Complex provides a perfect service during the whole year. Accommodation: The total capacity of the hotel is 30 rooms with 52 beds :16 double rooms, 6 rooms, equiped with bedroom sets, which can be used as singles. Available are 4 small apartments, 2 big apartments, 1 president apatment and 1 luxury apartment with Jacuzzi and vertical hydro - massage cabin. Available are: WC, bath - tubs, hair - driers, cable television with 50 programs, mini - bar, conditioner, direct dial telephone, personal safe for valuables, iron, table for ironing, scale for body weigh. Food: Restaurant with 85- 100 seats. This classical restaurant offers high qualitative wines from the most popular Bulgarian regions. Summer garden with 70 seats. Other services: Central heating, room service, air - conditioner, pressing service, laundry service, secure parking, safe deposit boxes, conference hall, fax and copy machine services, souvenir shop.